I woke up this morning feeling a bit like the beavers in the lodge I photographed yesterday morning at Huntley Meadows Park. They were snug and warm in their little house, surrounded by a world of snow and ice, with plenty of food at hand. As for me, there is well over a foot of drifted snow on the ground and more is still falling. Eventually I will need to get as busy as the proverbial beaver and remove some of the snow, but for now at least, it’s nice to enjoy it from the comfortable insides of my warm and cozy house. Early this morning the skies over Huntley Meadows Park were glowing red, adding a beautiful pinkish tinge to the icy landscape. The calm before the storm. Weather forecasters predict that the Washington D.C. metropolitan area will be hit with a major blizzard starting later today, with a total snow accumulation of two feet (61 cm) or more. The area will undoubtedly be paralyzed for at least several days. 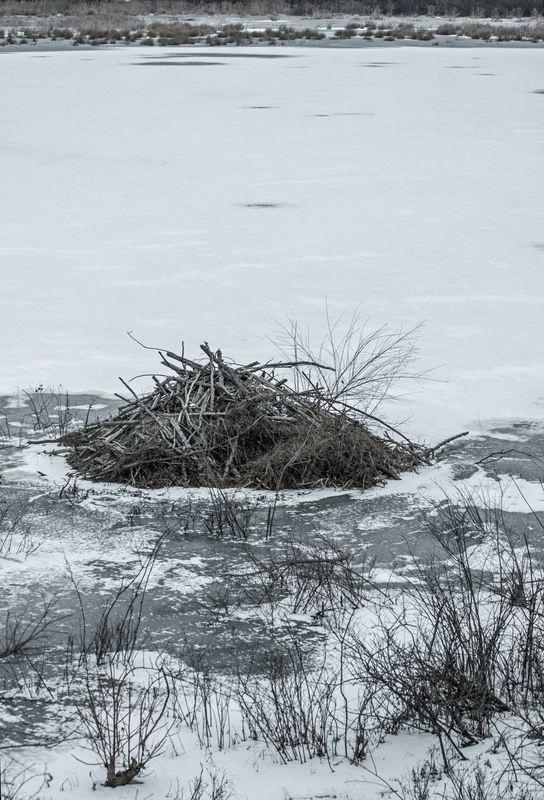 How do birds manage to survive when it is so cold outside? 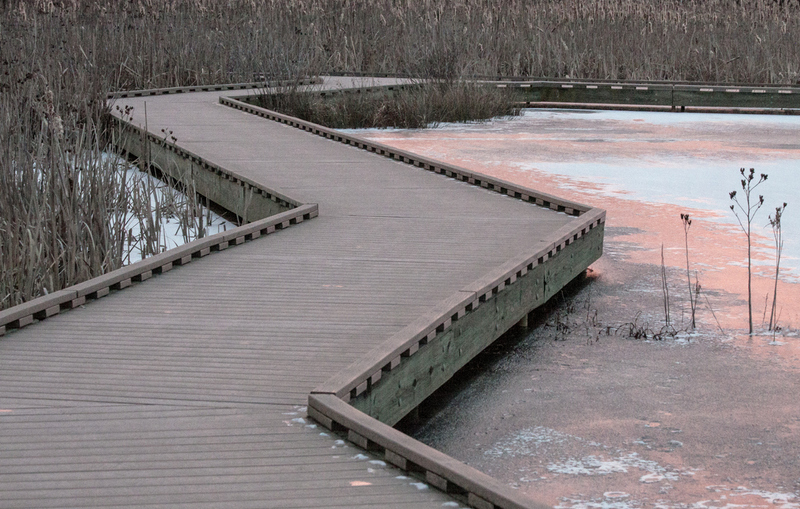 I asked myself that question early yesterday morning as I walked along the exposed boardwalk at Huntley Meadows Park. The wind was blowing hard and the temperature was about 20 degrees F (minus 7 degrees C). The landscape was empty and desolate and seemed to have little to offer as potential sources of food. Suddenly I noticed a small group of sparrows. 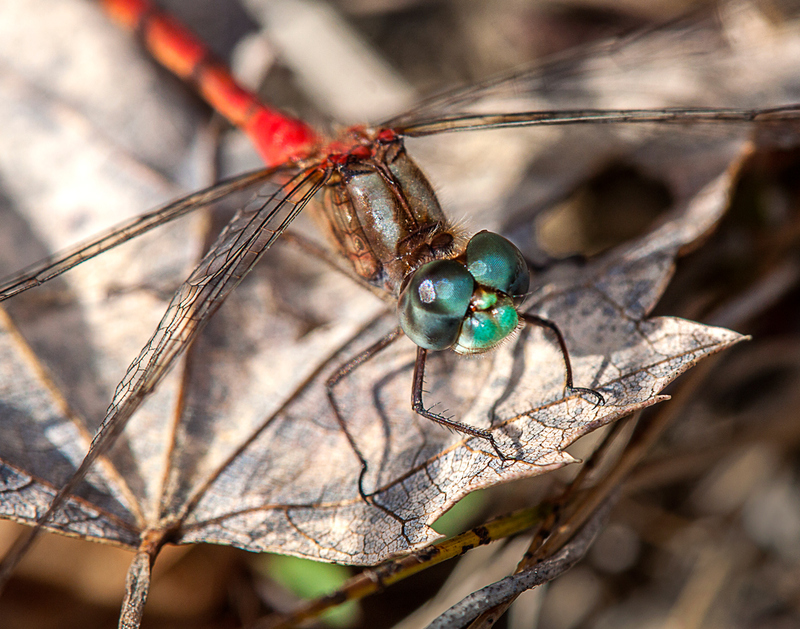 They would fly to a spot together and then individually forage among the dried out plants, including those sticking out of the ice. After a short period of frenetic activity, they would move on to another spot. 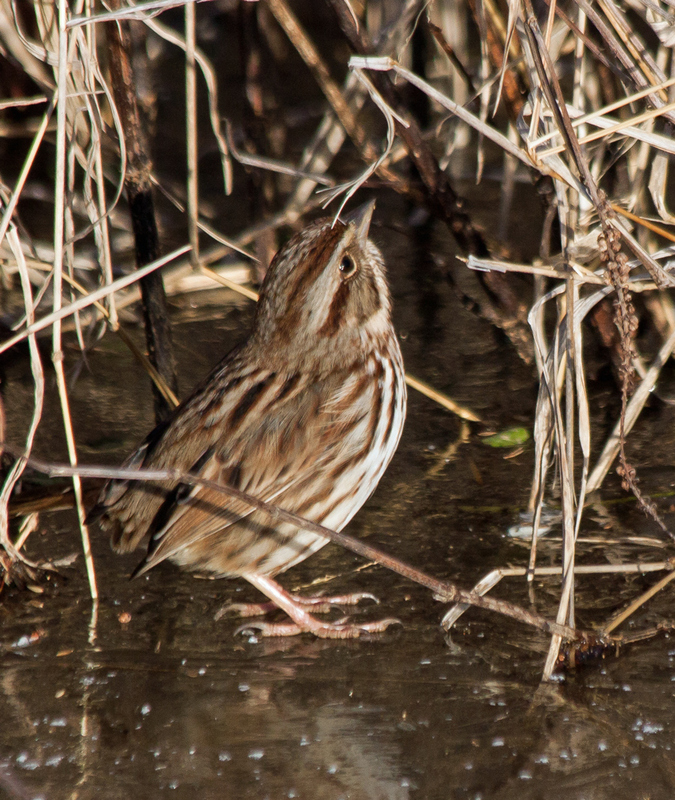 Initially, I knelt and tried to get some shots of the sparrows that were standing on the ice and reaching up into the vegetation. 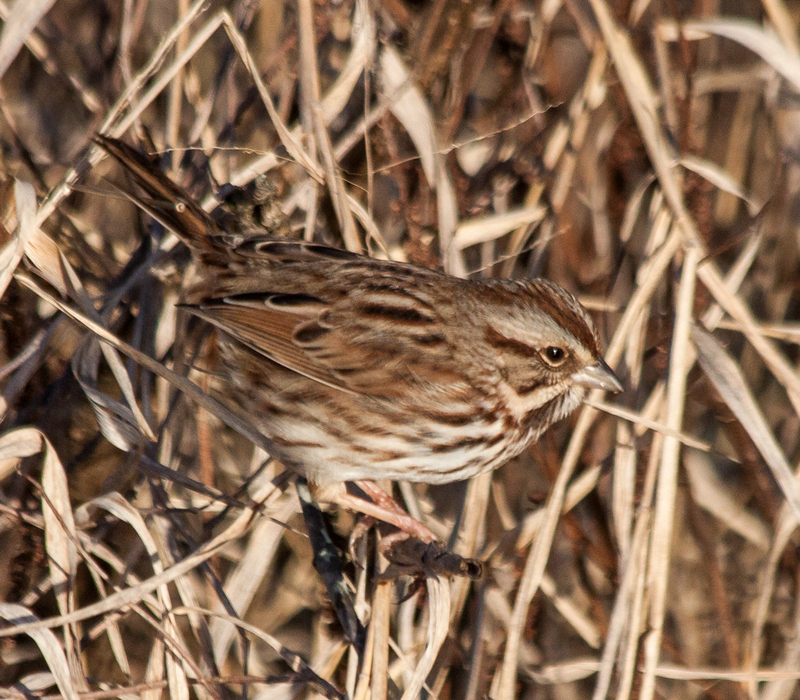 A bit later, I was able to capture some images of a sparrow perched on some plants in a more exposed position. I am not really sure what kind of sparrows these are. Earlier in the day I saw some sparrows that I could identify as White-throated Sparrows, but these birds seem to have a different set of markings. 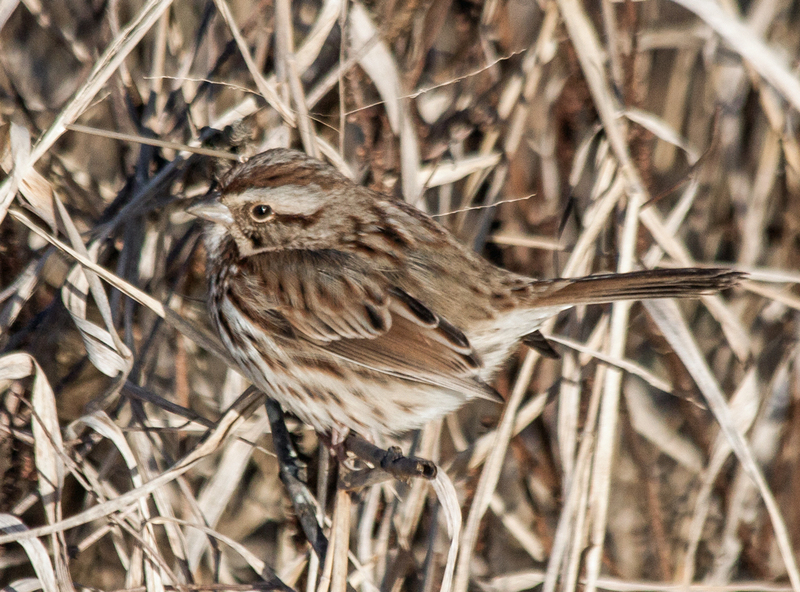 After looking at my guidebooks, I have concluded that these may be Song Sparrows (Melospiza melodia) and would welcome comments from more experienced birders on the identification, especially if I have misidentified the birds. 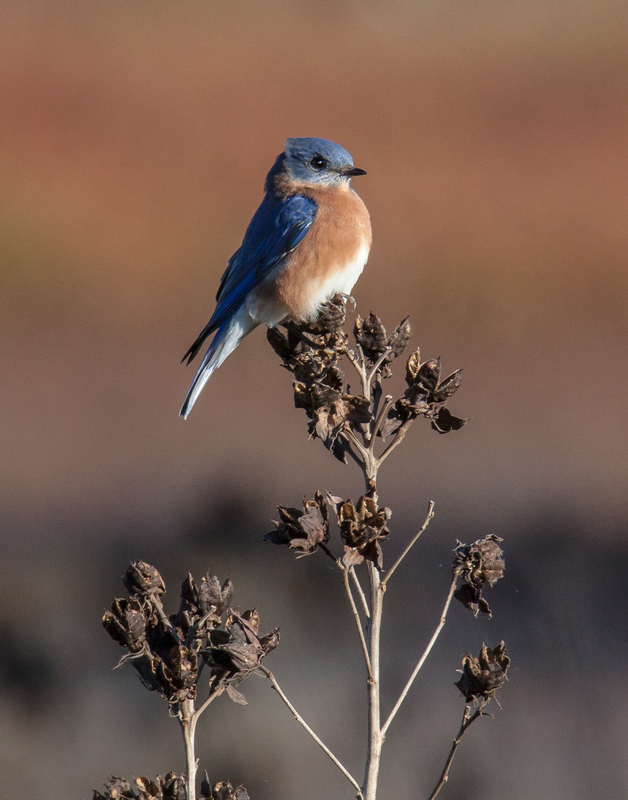 How do these little birds survive during the winter? From what I can see, they do their part by working hard as they forage for food and God provides for their needs. Early this morning, it was really cold and windy and most of the birds and animals showed great common sense in staying in sheltered spots. This little sparrow, however, seemed to be having a good time hopping, skipping, and skating across the frozen pond. It’s hard for me to imagine life on a farm, having spent most of my life in the suburbs. I consider myself lucky to be able to distinguish a cow from a horse, but don’t ask me to tell a llama from an alpaca. I got a little taste of farm life on Christmas Eve day when I accompanied a family member as she went about accomplishing a seemingly endless list of chores associated with the care of the farm animals. Here are some of the fascinating faces of the farm that I encountered that day. As many of you know, I recently entered some photos in a local photo competition and was fortunate to be awarded second place for one of them. I was a little surprised by the one that was selected, because, quite frankly, it was not my favorite one of the group. The more that I though about it, the more I realized how difficult it must be to be a judge, especially in an area like photography in which there is both a technical and an artistic component. I’ve never used a poll in a posting before, but thought that in this case it might be interesting to learn which one of my four entries is your favorite. I am not really asking you to judge which one is “best,” but am looking more for a sense of which one you like most. You can use whatever criteria you like and I would be thrilled if you gave a few words about your choice. As you can see, I chose a diverse set of subjects to appeal to a variety of tastes. 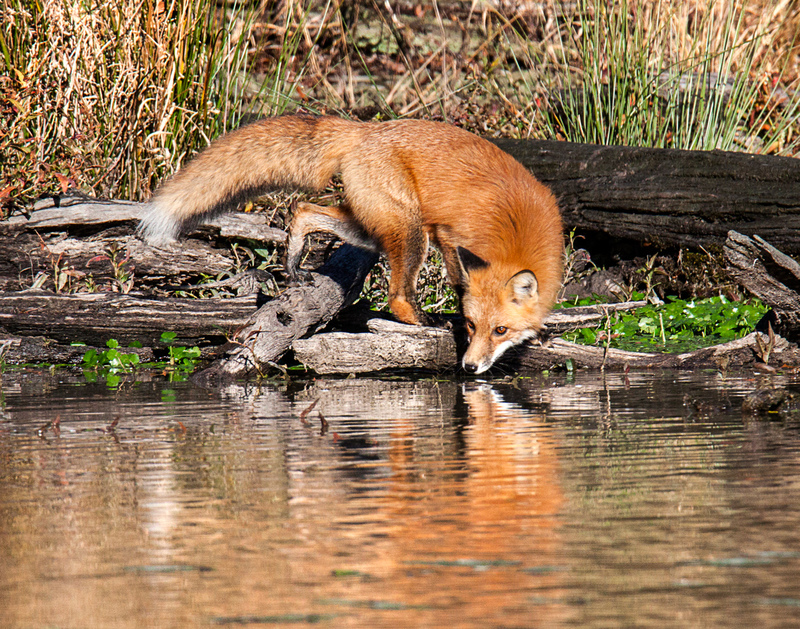 There are two birds—a Bald Eagle (Haliaeetus leucocephalus) and an Eastern Bluebird (Sialia sialis); one insect—a Blue-faced Meadowhawk dragonfly (Sympetrum ambiguum); and one mammal—a Red Fox (Vulpes vulpes). If I have set this up correctly, you can click on any image and scroll through each of them in full size. After viewing them all, select your favorite and register your vote. As I mentioned earlier, I’d be really happy if you left a few words about your choice. (I think the poll might let you vote multiple times if you have trouble choosing, but am not 100 percent certain, given that I am not familiar with the polling component.) NOTE: If you open the posting in Reader, you may need to click on the Title to get to the actual posting and to the poll. Thanks. Merry Christmas in advance for those celebrating Christmas and best wishes as we move toward the start of a new year. A year ago today my heart was breaking as I informed readers that the injured Bald Eagle at my local marshland park had been euthanized. 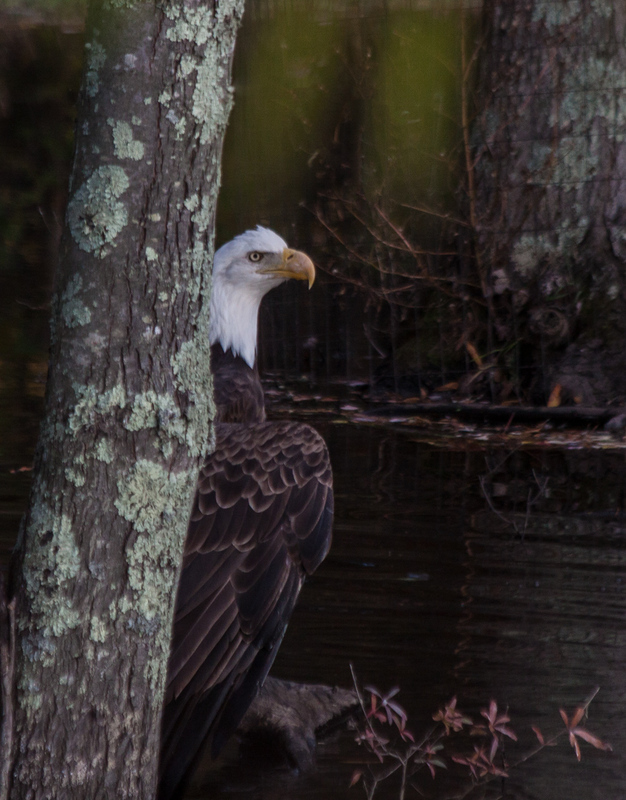 It was a really difficult posting for me to write, particularly because I had been so hopeful the previous day’s blog posting when I described the heroic rescue of the eagle. The emotions are still pretty intense, despite the passage of time. I felt something really special when I was privileged to look into the eyes of the eagle at close range, a bird that somehow retained a sense of majesty despite the pain she was obviously feeling. I don’t often re-blog my own postings, but today, I want to remember and treasure the moments that I chronicled. (If you want to know more details about the experience, there are links in the text below). We all like to believe in happy endings, but unlike fairy tales, real life does not always turn out that way. I was saddened this afternoon to learn that the female Bald Eagle (Haliaeetus leucocephalus) that was rescued on Monday at Huntley Meadows Park had to be euthanized. The dislocation of her elbow was chronic and so severe that eventual release was not a possibility. The doctors at The Wildlife Center of Virginia determined that humane euthanasia was the best treatment. I was happy that the work of the Fairfax County Animal Control Services officer that I chronicled in an earlier posting were featured today in the on-line editions of local media, including the Washington Post, WJLA (ABC television), WTOP radio, and Inside NOVA. The sad ending in no way diminishes my respect and thanks to Officer Kathy Prucnal for her extraordinary efforts to rescue the injured eagle. 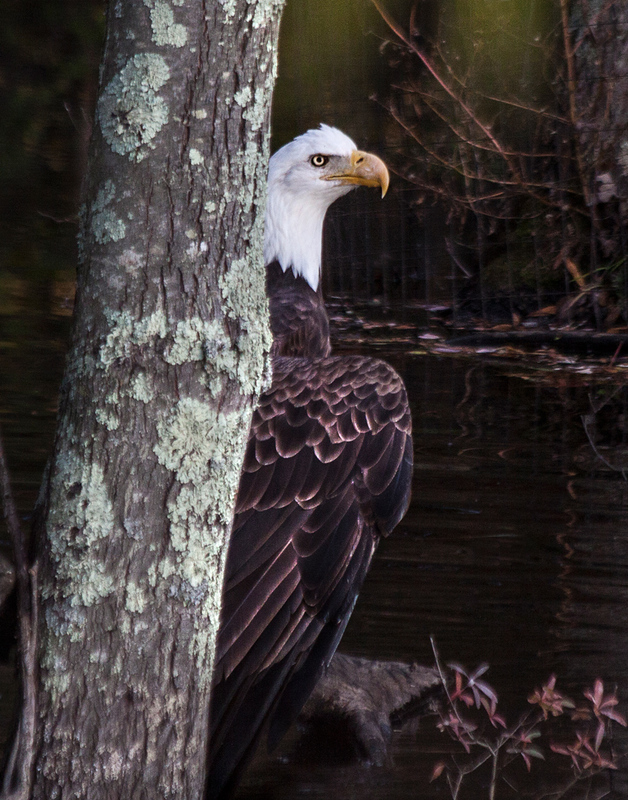 This photo that I took during the rescue is how I want to remember the female Bald Eagle, appearing strong and alert.